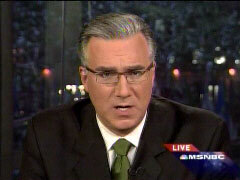 On Wednesday's Countdown show, MSNBC host Keith Olbermann attacked Jesse Helms as a "homophobe," and suggested naming a "gay-bashing organization" after the recently deceased former Republican Senator, as the MSNBC host attacked Senator Elizabeth Dole for her effort to name an AIDS funding bill in honor of Helms. Olbermann, addressing Dole as he made her a nominee for "Worst Person in the World": "Senator, you do realize that Helms opposed AIDS treatment, AIDS research, AIDS prevention. He opposed everything about AIDS except blaming the victims. And not just back in the blind panic days. As late as 2002, he blamed the disease on homosexuality. They should not name an AIDS bill after Jesse Helms. They should name a gay-bashing organization after him." 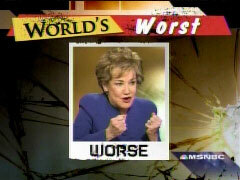 Olbermann teased his "Worst Person" segment during the show's opening: "‘Worsts' is back. Elizabeth Dole wants to name an AIDS funding bill in memory of Jesse Helms, who believed gay people deserved the disease." During a plug before a commercial break at 8:45 p.m., the MSNBC host called Helms a "homophobe": "And in ‘Worsts,' the Senator who thinks an AIDS bill should be named after homophobe Jesse Helms." But first, time for Countdown's number two story, tonight's "Worst Persons in the World." And the bronze to Republican Senator Elizabeth Dole of North Carolina. She's proposed an amendment to a current HIV/AIDS funding bill in the Senate which would name it in honor of her late predecessor, Jesse Helms. Senator, you do realize that Helms opposed AIDS treatment, AIDS research, AIDS prevention. He opposed everything about AIDS except blaming the victims. And not just back in the blind panic days. As late as 2002, he blamed the disease on homosexuality. They should not name an AIDS bill after Jesse Helms. They should name a gay-bashing organization after him. By contrast, on the July 4 CBS Evening News, Bob Schieffer observed: "Late in life, he struck an unlikely friendship with the rock star Bono, and joined Bono's fights against AIDS in Africa and Third World debt."